From Grape Juice and Itty Bitty Kitties to Subways, Seasons and nature in the City, Park Slope: The Album (Volume 1) captures the diverse joys of childhood in Brooklyn, New York and sets it to music by best-loved New York City Artists. Moms and Dads, Friends, and even a few Monkeys and Drunken Sailors drop by to sign, Run Around, Swing and Dream the happy hours away. It's the musical event of the year for children and their parents throughout Park Slope and beyond. Brooklyn, N.Y. â€“ January 23, 2007 â€“ Park Slope Parents, one of the nationâ€™s largest online parenting groups, today released a CD of childrenâ€™s music featuring 17 well-loved artists and songs that celebrate family life in the big city. 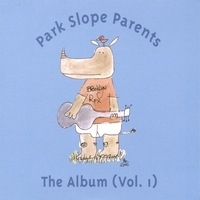 Produced through a volunteer effort by the groupâ€™s members, the limited-edition CD is a fundraising venture for the Park Slope Parents website at www.parkslopeparents.com , an essential informational resource for parents throughout Park Slope, Brooklyn, and beyond. A CD release party and concert will be held later this winter on a date to be announced. Park Slope Parents has grown rapidly since its inception in July 2002, attracting more than 6,000 members and offering an ever-expanding array of services including an email listserve, an informational website, a Halloween costume exchange, and other family-oriented events. When its operational needs began to strain its all-volunteer resources, the group sought creative fundraising opportunities. As an eclectic neighborhood of professionals and creative artists, Park Slope provided both the broad range of skills needed to see the CD to fruition as well as the community spirit needed to make it a true volunteer effort. The musiciansâ€™ contract was drawn up pro bono by a Park Slope attorney. The artwork was contributed by local dad Mo Willems, author of the classic books Donâ€™t Let the Pigeon Drive the Bus and Knuffle Bunny. Some songs were recorded specifically for the album using donated time at Trout Recording, a studio owned by Park Slope Parents member Bryce Goggin. Mastering, CD design, and distribution were also taken up by tireless (and often exhausted) parent volunteers. Proceeds from the Park Slope Parents CD will go toward content and technology maintenance for the Park Slope Parents website at www.parkslopeparents.com, an essential resource for local families as well as those further afield, offering information, recommendations, and advice on parenting and related issues. A limited quantity of 5,000 CDs will be sold at a suggested retail price of $18.99 through a grassroots distribution effort designed to support local Park Slope retailers. Beginning today, it can be purchased at Music Matters, Kidz Cut Zone, The Green Onion, Orange Blossom, Lolli, Nest, Maggieâ€™s, 3R Living, Gumbo, Bumblez Sweet Surprise, Lion in the Sun, Serene Rose, Blue Rose, and Razor, and online through CDBaby.com.